JNW’s color this week is PINE, and I so I thought I would share some green with a holiday feel. This is Spirulina from Hawaii. For a short while I was adding it to a morning smoothie, but because it tastes like “feet” – I just can’t seem to enjoy this nutrient dense, green vitamin rich supplement. These brussel sprouts, with a nice green, are from Trader Joe’s (for pennies) -they reminded me of the holiday stalk of sprouts in a vase over at Likeitiz – mmm. In the evening on Black Friday, we took my older son, and his lady friend, to Burger Bach. The green side salads were just as fresh as last time – and we had the same waitress as on our last visit (Blake)- but no video was made. The background photo behind the chili burger is a scarf my step-daughter gave me for Christmas 8 years ago (when she and her mom had a small business selling their homemade scarves). We tried this Kerrygold butter last week – we thought it tasted “okay” but we will stick to our regular butter. TC Conner tagged me for “holiday touring” (HERE) -So to answer his questions about Groundhog day, first, we do not do anything on that holiday and second, we have never had groundhogs in the garden (thankfully). To answer his third question: If you could live one day over and over again, what day would you choose, and why? Well TC, after thinking about that question, I came up with a handful of days – It was fun to think about (and I also recalled some days I would never ever want to live over again). We had just moved to the east coast and so venturing out to spend all day shopping with my mom and lil’ sis was more about together time. So with our small clutches and comfy shoes, we met at the crack of dawn to “do this thing.” We bought gift sets and clothes (notice the red vests in photo below) and my sister crossed off a big ol’ list of things to get. Some stores gave out a gift as we entered, and one store gave out chocolate bars (not bad quality either) with coupons inside the wrappers – and two of ours had 50% off any item. There was an excitement and buzz in the air that seemed pleasant and fun. We went to the mall, hit up a warehouse store, and snacked along the way. I still have some things I bought that day – like the wooden blocks that make a marble run, and a porcelain soap dish that came in a gift pack. We ended the day with dinner out together while chit chatting about this and that. I then drove home with my goodies and they headed back to their town to unload there. Falling in the door that night – the hubs and boys were fast asleep – and in hindsight I see that it was one of those days I would gladly live again. My boys wearing some fun holiday outfits I bought for them on a Black Friday sale. The little girl is our friend, Shannon, from San Jose. Paula’s theme this week is “young” and as this post winds down, I wanted to share our Christmas picture from 2000 (left). It is nothing fancy, but I chose that October snapshot with seaweed on the shoreline because it was exactly what life felt like that year – the raw beach (after landlocked CO) my nieces (who I had missed so much), and my very young boys (in their momma’s arms). If you have some time to check out a few other Black Friday reads, Sherri Matthews mentioned the ubiquitous cheap televisions that people stampede to buy (HERE- http://sherrimatthewsblog.com/2014/12/01/a-merciful-interview-bite-size-memoir/), Sir Spaniard CP wrote a cool little poem about Black Friday (HERE), and Jill Carattini wrote a faith based post about “Enough” (HERE). Lastly, it is not a Black Friday special, but doggie owners might want to peek at Terrierman’s post about Home Depot’s current “deal of the week” on dog food (HERE). December 5, 2014 at ..
and his burger had the “green” japs – so it fit better in the green theme – ha! December 6, 2014 at .. I have never tried them crisp, if I see them somewhere I’ll give them a try! Eeek the first two green food made me lose my appetite. 😊 oh well, I like the So What attitude answer on healthy eating elitist questions. 😀 The “taste like feet” reminds me of a Thanksgiving FRIENDS episode. That bacon burger looks deelish! I could eat one right now! I’ve heard news reports about Black Friday starting to be less popular these days, some say it might not happen next year. I do most of my shopping online, I’d guess cyber Monday might replace Black Friday. I wish groundhogs would stay out of my garden! You’re lucky! well cyber Monday was pretty cool – and I ordered some online vitamins and got a great deal off – so woo hop (but no spirulina). oh man those Kentucky groundhogs whistle pigs…. I’m not in Kentucky. I’m just one big mystery ain’t I? Ha very funny – and we must not forget that if we eat the meat of grass fed animals we can get the benefit of greens that way – which is why the corn fed beef is lacking vitamins…. I’ll have Brussels’ sprouts over spirulina any day….! Any more, Black Friday is like a whole week long. Not at all like when I was growing up. Stunning pics for this great post, dear Prior… Sending you all my best wishes! Yvette wow now that is a post! Anything that tastes like feet likely should be avoided. Sounds awful. Trader Joes is a store I love when we visit the US but you can believe there is not a single one in Canada!? Sounds like interesting times at your house with ‘friends’. Lastly wonderful memories of your shopping time with your Mom and little ones. Wishing you a happy weekend! Great post. Love the pines. I love snacking on seaweed too! Thank you so much for sharing. December 7, 2014 at .. I agree about that spiralina Y, I remember having a health kick back in the 80’s and trying to convince myself that something that tasted so bad must be good for you. I gagged my way through the tin I bought, it was expensive and I was loath to throw it out. But your comment about the smelly feet brought back that memory. But I’m loving the Brussels sprouts and the scarfburger! December 9, 2014 at ..
Hi Forthemo – glad the spirulina works for you. December 12, 2014 at ..
(EN) I read” skim and go”. I didn’t mean offend your work and I agree that there are different and several points of view. My point of view is : if I truly like something( your blog now), I try to say what I like but also what not.If you do that to me, I can learn what you really appreciate and what not. (IT)Ho letto” sfoglia e vai”. Non intendevo offendere il tuo lavoro e concordo che ci sono diversi e parecchi punti di vista. Il mio punto di vista è: se veramente mi piace qualcosa( il tuo blog ora),cerco di dire cosa mi piace e anche cosa no.Se fai questo a me, posso imparare cosa apprezzi davvero e cosa no. "War-And-Peace-length posts" and she goes on to say…. "If the WP Reader says 2,000+ words, count me out. To be honest, for anything over 1,300, I have to be seriously into the blogger and/or the topic." 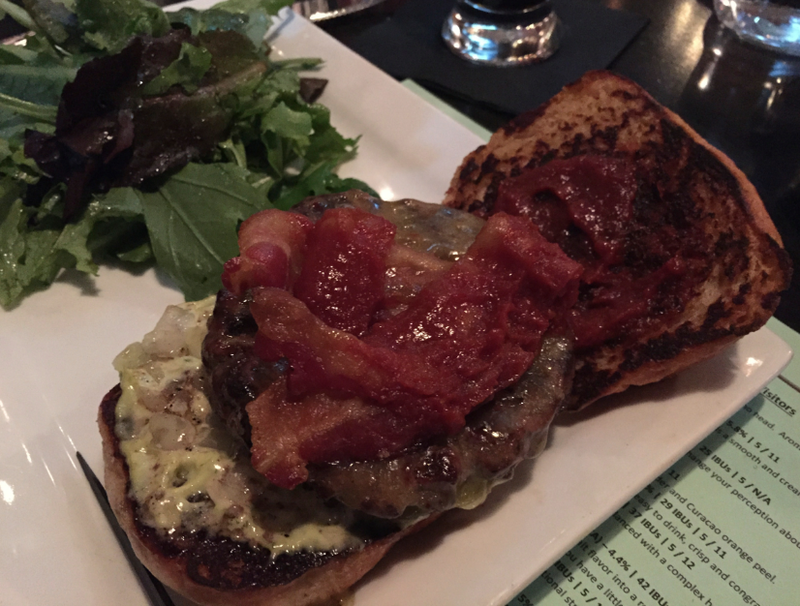 That green Hawaiian powder is no match for Burger Bach, what a name by the way, but the burger looked…..hummmm! Double dating with mom….I can´t imagine that ever have happened to me. Although it sure would have been interesting for sure. You´re a cool mama! December 13, 2014 at .. I will go for burger and brussel sprouts…I am not sure about spirulina, don’t know the taste but from your picture, I have to say the color looks great – so green and healthy! Hope you are having a wonderful weekend Yvette! Best wishes! December 15, 2014 at ..
December 24, 2014 at ..